NEW third generation THERMAGE CPT ALREADY in the Era Esthetic Laser Dermatology Clinic! Thermage is the first non-invasive treatment designed for skin lifting. Surgical operations decreased by 70% worldwide with the development of laser technology. Most commonly, surgery is now applied where non-invasive methods cannot help. With age, collagen synthesis slows down, its fibers become less resilient, begin to disintegrate and, as a consequence, the skin lines and folds form, elasticity of the skin reduces. During a single Thermage procedure doctors restore a sufficient amount of collagen in the deepest layers of the skin, tighten the skin and can visibly improve the appearance of the skin making it smoother, younger and firmer, this way, long-lasting natural changes are achieved. The changes are immediately noticeable and intensified, are evoked several years after the procedure. During the episodic period, not only skin rejuvenation, but also prophylaxis, aging signs is suspended. The spray effect can last up to 3-5 years, depending on the body’s physiological properties. What is non-surgical skin lifting, the actual thermolifting? The previous Thermage technology was called Thermage NXT. A new third generation Thermage CPT has already arrived to Lithuania, Era Esthetic Laser Dermatology Clinic. Thermage CPT emites the patented RF (Radio Frequency) waves, which promote the renewal of collagen present in the skin, synthesis of new collagen in the deep layers of the skin, and as a result of the process, new collagen fibers form regularly – exactly as they do in young age, thus causing skin lifting. This is not a surgical treatment: it does not require a post-procedural period and is an alternative to plastic surgery. Thermage CPT is a safe and clinically proven non-surgical method of face and body skin lifting and contouring, cellulite treatment. Due to the increased collagen synthesis, appearance, color, contour and structure of the skin improves. Thermage CPT does not damage the skin and no preparations are forced into the body. 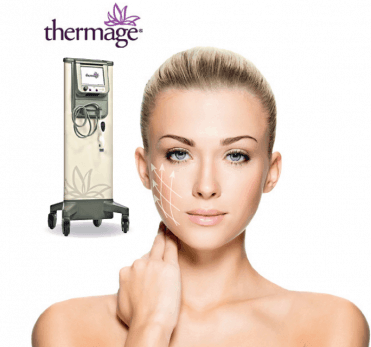 Thermage CPT can be applied to anyone who wants to look younger, but are hesitant about surgery and want to get back to their usual activities on the day following the procedure and without any post-procedural period. It is a non-surgical face and body skin lifting which is now possible to perform using the new Thermage CPT available in Lithuania only at Era Esthetic Laser Dermatology Clinic! Often this technology is mistakenly thought to be same as the so-called “thermolifting” where a unique Thermage technology is not used at all and it is recommended to have 5, 7 or 10 of such procedures. The genuine Thermage procedure in Lithuania is performed in three clinics, one of which is the Era Esthetic Laser Dermatology Clinic where the Termage procedure can be performed using the new Thermage CPT. Important! Thermage CPT can be performed in the summer! How many procedures are performed? A SINGLE PROCEDURE is sufficient to achieve the desired effect when using the THERMAGE CPT technology. To which body areas is the THERMAGE CPT skin lifting applicable? Face: In order to provide younger and healthier appearance for the ageing, flabby, saggy or wrinkled facial skin, or the skin excess. The upper area of the face – the forehead: the eyebrows and skin of forehead is lifted. The middle area of the face – cheeks: moderate lifting, skin pores are reduced, nose-lips puckers becomes smoother. The lower area of the face – restoration of the face oval and its contour, jaw line (slackness of the skin under the lower jaw is reduced, and the lower jaw line becomes smoother), the double chin decreases or disappears. The upper and lower eyelids, the area around the eyes, loose skin, wrinkles, bags under the eyes – wrinkles become smoother, the skin of the eyelids and upper cheeks becomes firmer and is lifted. Neck – neck wrinkles are reduced, the skin is lifted. Body contouring in case of saggy skin in abdominal area, areas of arms and legs, flabby knees. Cellulite treatment. For the cellulite treatment we also use the most popular anticellulite massage VelaShape III, to read more about it – VelaShape III. Volume reduction and cellulite treatment. Technology Termage CPT uses its own update mechanisms of the skin, when the body is responding to the impact of the laser itself stimulates the synthesis of new collagen to significantly improve the appearance of the skin, making it more elastic, smooth and youthful. The procedure is strong and in many cases comparable with plastic surgery. This procedure poses no surgical risks and there is no need for a post-procedural period! No need to take a leave in order to have the Thermage CPT procedure performed. The patients can return to usual daily and leisure activities – go to work or to the theater immediately after the procedure. New! During the procedure, patients feel no pain, just comfortable warmth, anesthesia is not required! That is why the new thermolifting Thermage CPT system’s patented name is Comfort Pulse Technology. 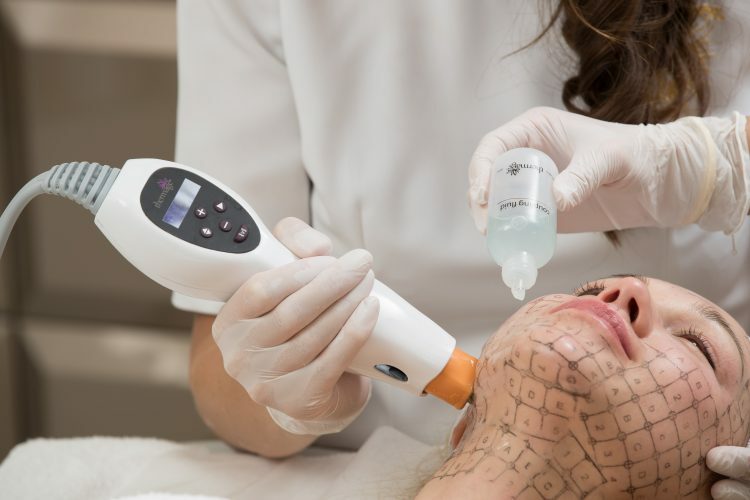 The new technology Thermage CPT procedure can be performed in all areas of the face and body, including the eyelids, knees, arms, abdomen, thighs, and other problematic skin areas in which age-related skin problems occur. New! Thermage CPT is specially improved and applicable in the treatment of cellulite! How much time will the THERMAGE CPT lifting procedure take? The procedure, depending on the area treated, will take from 40 minutes to 3 hours. The results of the unique Thermage thermolifting procedure are visible immediately, and are gradually improving in the course of 3-6 months to one year. What to expect after the THERMAGE CPT treatment? You will not look like a different person, as Thermage CPT uses the body’s natural recovery mechanisms and, therefore, the changes are natural. There is no post-procedural period following the procedure, except for a slight redness because of the heat. Imagine your appearance 5 years ago – this is a change that can be expected in 6 months after a single Thermage CPT procedure. It will still be you but more radiant, younger, healthier looking and having softer and firmer skin with less pronounced lines and wrinkles. The effect, depending on individual process off aging and the lifestyle, can last 3-5 years. The procedure is non-invasive and safe so, wishing to achieve an even greater effect, it can be repeated after half of the year at the earliest. 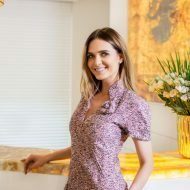 This procedure is no secret to Hollywood stars who have the Thermage procedure performed every year for healthy skin appearance as there is never too much collagen! Its dedicated users are Oprah Winfrey, Linda Evangelista, Brad Pitt, Gwyneth Paltrow. New! New generation of peptide technology that reduces bags under the eyes with Prostrolane Inner B Se injection. Thermage CPT thermolifting procedures are performed by the qualified dermatologists of the Era Esthetic Laser Dermatology Clinic.